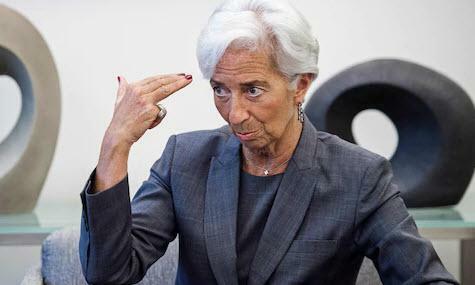 IMF Managing Director Christine Lagarde just stole the consensus jam out of the global recovery donut, warning during a speech in Washington that trade wars and tighter credit are dimming economic outlooks, signaling that her outlook for 3.9% growth may be overdone. The fund will update its World Economic Outlook on Oct. 9 ahead of opening its annual meeting in Bali, Indonesia. “Six months ago, I pointed to clouds of risk on the horizon,” Lagarde said, according to her prepared remarks. 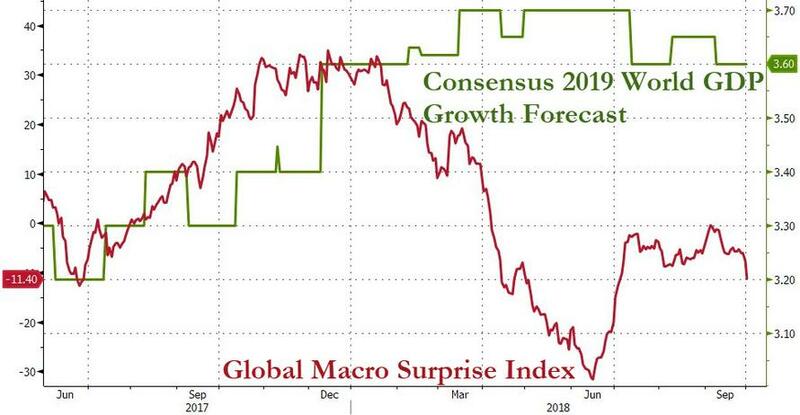 One glimpse at the collapse in global economic data and it's perhaps more than obvious that consensus needs some adjustment...While Lagarde acknowledged the global expansion is still the fastest in seven years, recent data suggest a cooling. As Bloomberg reports, Lagarde said protectionist rhetoric was turning into “actual trade barriers,” spreading uncertainty among businesses and consumers. A strengthening U.S. dollar and tightening financial conditions have increased challenges for many emerging markets, she said. Specifically, Lagarde called on countries to resolve their trade disputes, warning that the fracture of corporate supply chains could have “devastating” effects. “History shows that, while it is tempting to sail alone, countries must resist the siren call of self-sufficiency -- because as the Greek legends tell us, that leads to shipwreck,” she said, without naming countries that are putting up new barriers. Additionally, Lagarde warned nations to guard against “fiscal and financial turbulence.” She said global public and private debt has reached a record $182 trillion, up almost 60 percent from 2007. Emerging markets and developing countries are being pinched as central banks raise interest rates in advanced economies, she said. “That process could become even more challenging if it were to accelerate suddenly,” she said. “In too many cases, workers and families are now convinced that the system is somehow rigged, that the odds are stacked against them,” she said. Ironically, she urged this rebuilding of trust while noting that since 1980, the top one percent of income earners have captured twice as much of the gains from growth as the bottom 50 percent.. but we should all trust them now...?